A spirited second half display saw FC Barcelona so nearly stage an epic comeback against Celta Vigo, but it turned out to be another unhappy visit to Balaídos in a seven-goal thriller. Three rapid first-half goals from the hosts caught Barça off guard and, while Luis Enrique’s men twice rallied back to reduce the deficit to a solitary goal, they ultimately left empty-handed. Barça turned up at Balaídos needing no reminding of the threat that Celta’s speedy attack could pose, having suffered a 4-1 defeat last time they were in town, but few could have expected what took place in the first half this time around. Despite a good start, warning signs of Celta’s growing attacking threat began to appear as the half grew on. And when Marc-Andre ter Stegen’s pass out to Sergio Busquets was a touch wide of the midfield man, Iago Aspas was more than happy to step in and play Pione Sisto through on goal, who made no mistake with a neat finish. 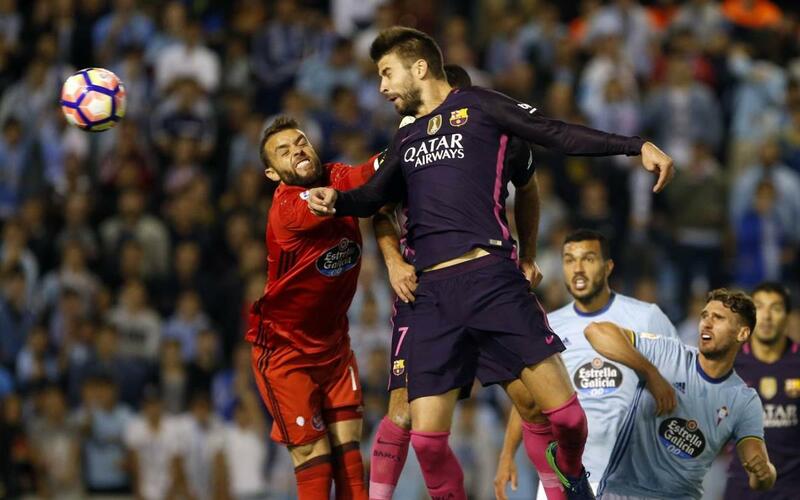 Rather than Barça being galvanised by the setback, it was Celta who seized the initiative. From Luis Suarez twisting and turning in the Celta box in attempt for an equaliser, a long clearance up field found Aspas bearing down on goal. Still with plenty to do, the Spanish forward gained a yard on Gerard Pique before striking powerfully into the bottom corner for 2-0. It was shaping up to be another nightmare night for Luis Enrique’s side in Vigo, but it was about to get worse. Just two minutes later, a devilish bouncing cross into the box was diverted into his own net by Jeremy Mathieu to set Barça a mountainous task for the second period. With Barça shell-shocked, the calm and collected presence of Andres Iniesta was summoned for the second period in the hope of sparking a revival, and it worked. On 58 minutes, the midfield maestro swung in a perfect cross begging to be knocked in. Pique duly obliged as he leapt in front of the onrushing keeper to give Barça hope. Five minutes later, it was 3-2. With Iniesta again the architect, Hugo Mallo was adjudged to have brought down Andre Gomes in the box and the referee pointed to the spot. Neymar Jr’s slow run-up seemed like an eternity but, in a flash, Barça were back to within just a goal of drawing level as the Brazilian expertly dispatched. Barça had their opponents pinned back into their own third and, with the home fans and players visibly rattled, a leveller looked inevitable. But just as the blaugrana were in the ascendancy, hopes of an epic comeback were dented by a freak defensive mishap. Ter Stegen, in his attempt to keep Barça ticking with a pass out from the back, instead found the head of the onrushing Pablo Hernandez, which found its way into the net via the post for 4-2. Nevertheless, Barça refused to give in. On 87 minutes, another second half sub was the provider for 4-3. Denis Suarez showed great strength to hold off Aspas before chipping into the box for Pique to head home for his second of the night. Whipping in crosses is not exactly a trademark of Barça’s philosophy but it was proving the most effective source for creating chances on goal in Vigo. On 90 minutes, Neymar leapt at full stretch to connect with another delivery from out wide but could not divert goalwards. The game had just about everything, and it so very nearly conjured up the unthinkable – a Gerard Pique hat-trick. Denis whipped in another beauty from the right and the centre-back rose highest again, but his header whistled wide of the mark, very much like Barça’s hopes of an equaliser.